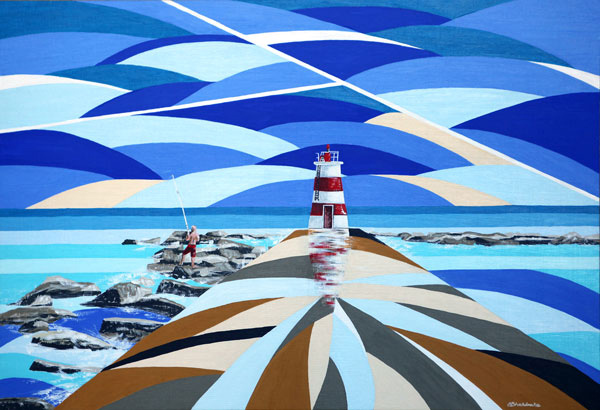 I am a self taught artist, and I am currently painting a wide range of modern style landscapes, seascapes and familiar objects within my self-titled ‘New Wave’ Collection. I am inspired by the reflections of light upon water and colour; and especially the intense warm light of the Algarve, where my studio is based. I love the rich buttery texture of acrylic paint; preferring to prepare my own art boards; and I create modern ‘tablet’ style paintings with a hidden frame which are particularly suited to a modern decor. My art will always contain a representational focal point – a boat, nesting storks, a path to the beach – which is then enhanced by an almost abstract series of ‘waves’ of colour and shape – allowing the viewer to bring their own imagination to the picture. I also enjoy painting big bold flowers which almost seem to jump off the wall towards you, which are full of detail and bright colours. I create harmonious – yet vibrant – paintings; and my hope is that when people see my work they will see the excitement I have when I see a new view and immediately know that I have to paint it! I am also available to commission for pet portraits and house portraits. You can view my work via the Galleries on this website.